You probably know all about the cows, sheep and goats that live on farms. But did you know that there are wild cows, sheep and goats living throughout the world? All members of the cattle family have cloven feet, meaning the hooves are separated into two toes. 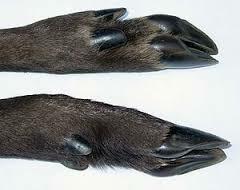 All about the cattle family, members have cloven feet, meaning the hooves are separated into two toes. These furry mammals are valued for their milk, meat, fur and ability to carry things. In Africa, cattle are especially valued. Here, people sometimes drain a little blood from a cow for food, but only butcher cows on special occasions. Cloven feet of cattle family. The cattle family includes yaks, water buffalo, oxen, bison, goats and sheep. European bison and American bison were hunted almost to extinction. A few herds remain. 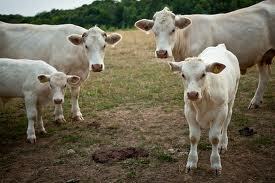 Cow manure, or dung, is sometimes dried and burned for heat in places where there is no firewood. Manure fertilizes the soil so grass and other plants grow. Cows eat grass, which is hard to digest. They have four stomachs to do the job. 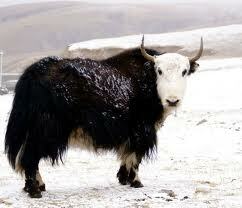 Yaks belong to cattle family. 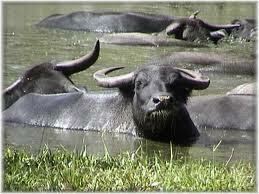 Water buffalo are cattle family members. 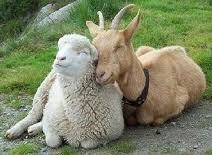 Goats and sheep also belong to cattle family. A video of water buffaloes clashing into each other. Question: What does “chewing the cud” mean? Answer: Cows chew grass and swallow it. Later, they spit it up and chew it again. Question: Are horses members of the cattle family? Answer: No, horses do not have cloven feet. Enjoyed the Easy Science for Kids Website all about the Cattle Family info? Take the FREE & fun all about the Cattle Family quiz and download FREE Cattle Family worksheet for kids. For lengthy info click here.